Visited Shirdi this Dipawali. Reached one day before Dipawali. 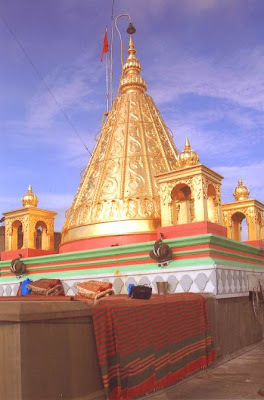 Visiting Shirdi is always a splendid out of the world spiritual experience. The day i reached Shirdi, was supposed to meet a priest in regard to staying for the padayatris (people visiting Shirdi from Surat with Palkhi). A devotee had given me the job to get the sanctioned letter for their stay in accommodation provided by Shri Saibaba Sansthan guest houses. 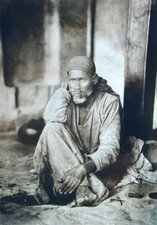 While conversing with the priest, i happened to tell him, how i was least interested in Shirdi Sai Baba and got my first experience near the stone on which Sai Baba used to sit, which is placed opposite the gate of Holy Dwarkamai or Masjidmai. 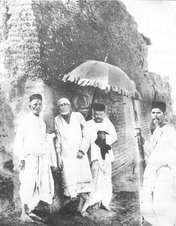 I went there wearing the shawl sanctified at Sai Baba's Samadhi, in Masjid Mai, on the stone which Sai Baba used to sit. Wearing (see picture which i just ckicked from web cam ) that shawl makes me feel like Sai Baba's hand is on my head. Strong working is felt in the head. The priest promised me to give me a cloth from the temple for the meditation purpose. Also holding the sacred book Shri Sai SatCharitra gives lots of vibrations and helps a lot while meditating. This always brings me memories of the mention of a brick which, with Sai Baba used to meditate, mentioned Shri Sai SatCharitra Chapter 43 & 44. Few days ago happened to read the following about the brick, in a yahoo group newsletter. Ever since Baba came to stay in the Dwarakamai, He had a brick with Him. This brick was His constant companion. With great affection and care Helooked after it. Though an inanimate object Baba loved it and called it His 'life long companion' Baba in His characteristic way referred to it as "her'. Although she was an earthen brick she was well backed and sturdy. 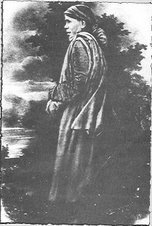 She was one foot long, 9"inches wide and 3"inches in depth Baba would support His hand on her while he sat in solitude in the Dwarakamai. When He slept, He used her as a pillow. Mhalsapathy and Kashiram Shimpy would worship her, after performing "Mangal Snan". Then carefully place her against the pillar adjacent to the Dhuni Maa. At night they would wrap her in a clean cloth and give her to Baba to use as a pillow. 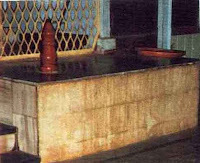 Though Mhalsapathy and Kashiram were constantly with Baba it did not occur to them to ask Baba about the significance of this brick? of Shirdi used a brick for His pillow. 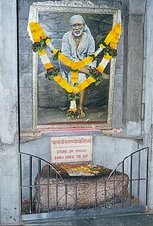 (Source Shri Sai Leela Magazine)"
After reading about the brief mention of the brick in Shri Sai SatCharitra Chapter 43 & 44, i was too curious to have a look and place my head on the brick and tried hard to find it somewhere in Shirdi, only to learn later that the brick was placed as the pillow underneath Sai Baba's head, in the Samadhi. So the holy brick which Sai Baba loved so much is in the Samadhi. 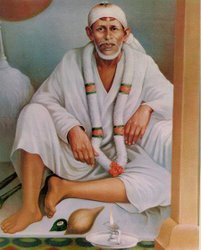 Also feeling the great vibrations i call it love and grace of Sai Baba, one more incident i always remember from Shri Sai SatCharitra chapter no. 27 about the mention of Vishnu Sahasrnama ( Thousand names in praise of Lord Vishnu ). Sai Baba to his beloved devotee Shama told, "Oh Shama, this book is very valuable and efficacious, so I present it to you, you read it. Once I suffered intensely and My heart began to palpitate and My life was in danger. At that critical time, I hugged this book to My heart and then, Shama, what a relief it gave me! I thought that Allah Himself came down and saved Me. So I give this to you, read it slowly, little by little, read daily one name at least and it will do you good." As mentioned in the first experience i had a similar experience while hugging Shri Sai SatCharitra and at that time i was not even a regular reader of the sacred book. During this visit, in a small shop just outside Hotel Goradias, where i normally stay, along with other books on Shirdi Sai Baba, i also happened to see The thousand names of Vishnu, with English translation and meanings of each name given in a line or two. Each name is the shortest expression of the profound meaning of God essentially Sabka Malik Ek. The expression of one unlimited, indivisible formless God. While reading the Mantras and the short meanings from this book, as i read each mantras, i was amazed, how Sai Baba showed during his presence in physical form oneness with each and every name. 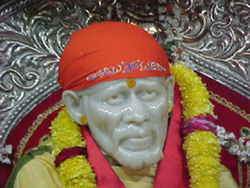 Will be writing about each name and how Sai Baba showed oneness with the Highest the God in following posts. During the two days stay i read the Sai SatCharitra in the open courtyard opposite Dwarkamai, as it is open during whole night, and only few devotees where present. Started reading from 11 in the night till 4 in the morning first day. The first half hour i could read exactly at the place where i had received the first experience of Sai Baba's tremendous grace. Then kept on changing places of 1 hour reading each. Next night at about 2 in the night the reading of the book was completed as i also gave few hours of reading in the Parayan Hall made for the purpose of reading by Shri Sai Baba Sansthan Shirdi. The experience i got, cannot be put in words. Jai Sai Ram ! Sat Chit Anand SadGuru Shri SaiNath Maharaj Ki Jai !!! is all i can say !!! For comments to be approved - Please use proper grammer, ie use proper spellings, spaces and a capital letter after full stop and such. If your comment is long, use paragraphs for easier reading experience. Do not use all capital letters all the way. 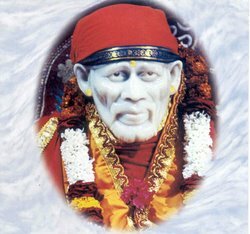 Traveling Shirdi for First Time ? 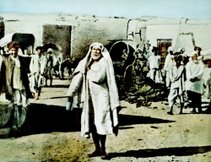 Also popularly known as "Shirdi Wale Sai Baba".